New English light-welterweight champion Tommy Martin. Tommy Martin says winning the English light-welterweight title proves he wasn’t ‘crazy’ to quit Peterborough United. At 20, Martin has a bright future in front of him after thoroughly out boxing bookies’ favourite Ricky Boylan for the vacant St George’s belt in front of the Sky Sports cameras at the O2 Arena on Saturday night (January 31). 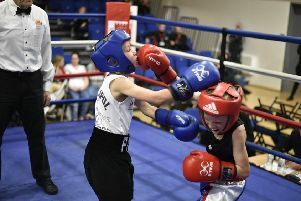 The St Neots boxer revealed afterwards he had fought with a chest infection - “I was struggling to breathe,” he said - but was still a clear winner on the three judges’ cards. He says the win - his 11th in a promising career - vindicates his decision to walk away from Posh after being offered a scholarship as a goalkeeper. “People thought I was crazy,” said Martin. “There I was training with Joe Lewis, George Boyd and all the first teamers, but all I wanted to do was get down the boxing gym. “But I knew what my passion was - and what I wanted to do. I always planned to give boxing everything - and that’s what I’ve done. Martin proved that with a career-best performance. In the opening two rounds, he let his hands go to knock Boylan onto his heels, then settled to pick him off with every punch in the book and win by scores of 99-92 and 97-93 (twice).